The year was 1876 when our forefathers first opened Tremayne’s Pharmacy, guided by a dream of supplying exceptional healthcare services to the families of Sutton and beyond. They stocked its shelves with a sweeping array of products for healthy living, and staffed its counters with pharmacists as friendly as they were knowledgeable. 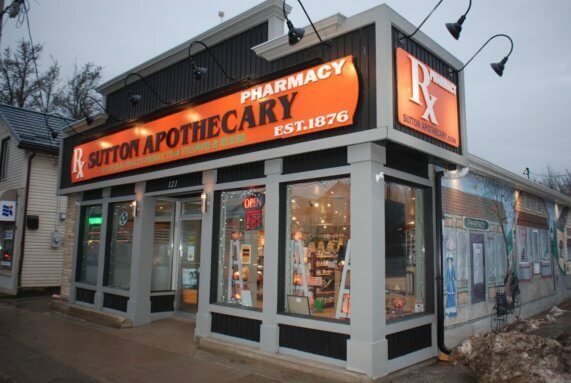 More than a century later, our humble pharmacy continues to provide outstanding healthcare service to Canadians across the area under a new name-Sutton Apothecary. Though our name has changed and our products and services have advanced, our unwavering commitment to customer service remains the same. Our top pharmacists continue to follow in our founders’ footsteps, delivering healthcare products and services with friendliness, compassion, and professionalism. We give each and every one of our clients and patients personal attention, whether they are refilling a prescription or shopping for personal hygiene products. Our staff provides an array of healthcare and customer services with dedication, skill, and a friendly smile. We treat our clients to individualized attention, working to ensure we satisfy their unique healthcare needs and personal goals. We strive to deliver all medications and other products in a timely, organized, and reliable manner. We believe our clients’ health and well-being should be valued above all else, and make extra effort to ensure they never have to wait for a prescription or return an unsatisfactory product. Our pharmacists & specialists take time to educate customers on medications & other products, counseling them on prescriptions and suggesting health care products that may suit their needs. We make an effort to develop a relationship between pharmacist and patient to improve therapeutic outcomes. Vitamins and supplements are essential for a healthy lifestyle, supplying nutritional needs we can’t get from diet alone. At Sutton Apothecary, we carry a wide variety of quality vitamins and supplements from a comprehensive array of top purveyors. Whether you are trying to shed a few pounds or accommodate special dietary needs, Sutton Apothecary stocks many different natural and effective diet and nutrition products that can help you reach your goals. At Sutton Apothecary, we carry beauty and skincare products that eschew harmful chemicals in favor of natural and luxurious ingredients. Our makeup, lotions, soaps, and other products will leave you feeling and looking radiant. Personal hygiene is an important part of feeling and looking good, which is why we offer a variety of hygiene and personal care items made from superior, all-natural ingredients. Feeling under the weather? Got a back ache? Suffering from an itchy rash? Sutton Apothecary can help. We’ve got many natural products that can solve a variety of healthcare problems and concerns. Our pharmacy is staffed by knowledgeable and experienced pharmacists, each dedicated to filling prescriptions in a timely and efficient manner as well as providing guidance on medication use, complications, and overall experience. We believe our youngest customers are the most precious part of our community. That’s why it’s so important to treat them with only the finest healthcare products made from safe, natural, and effective ingredients. At Sutton Apothecary, you’ll find numerous products that can help you care for your body in the comfort of your own home, from diabetic testing equipment to heating pads. We carry natural treats, herbs, and cleaning supplies. At Sutton Apothecary, we aren’t content with being just a retail store-we are the go-to venue for all your pharmaceutical needs. We offer a comprehensive array of both medication and clinical services. Online education services providing information on the safe use of herbs and supplements, medication instruction, healthy recipes, and other health and wellness tips. If you have a medication-related emergency or question, we have solutions. You should also feel free to visit our website to order medication and products, or to explore information on health, nutrition, and fitness. As a fully accredited pharmacy through the Ontario College of Pharmacists, we’re prepared to fill all your pharmaceutical needs. Come on over to Sutton Apothecary today to browse our extensive array of natural products and meet our specialists. QUESTIONS? CONCERNS? CALL US TODAY! Our pharmacist on duty, Michael Ramzy, will be glad to hear from you and answer your questions.